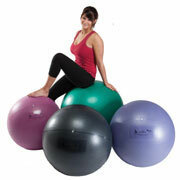 The Theragear Swiss Exercise Pro Ball features extra thick walls, constructed to perform with exceptional durability for your workout and offers maximum firmness and support. If the ball is punctured it will deflate safely and slowly. The Theraguard™ ABS system is burst-proof up to 500 lbs. and has a 2,200 lbs. static weight limit. It will not flatten out! Fitness professional and casual fitness enthusiasts will get the most out of their daily workout using the Theragear Swiss Pro Ball. ×Warning: Swiss balls should be used for body weight exercise only and are not suitable for bench press exercises or use with any kind of weights in order to avoid any potential injuries to users. Free of phthalates, and latex maintaining the smallest environmental impact. Static Weight Limit: 2,200 lbs. Burst Proof Strength: 500 lbs.